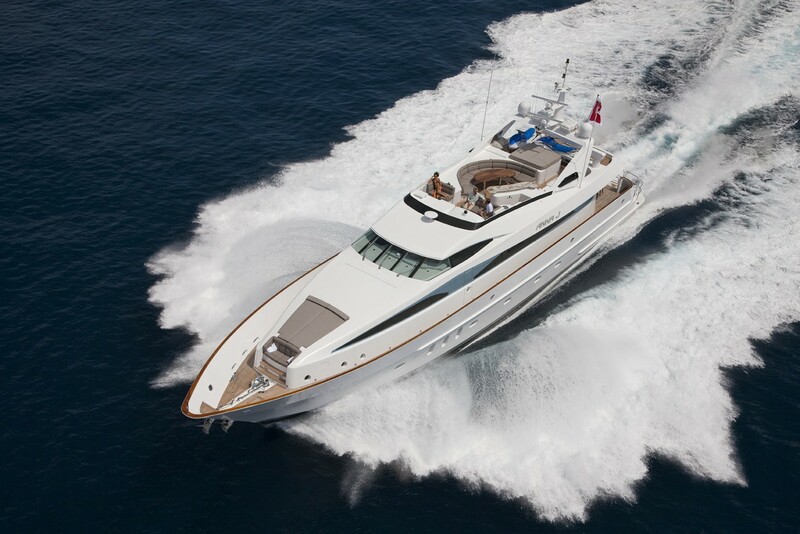 Luxury motor yacht STREGA is a Palmer Johnson motor yacht built in 2000 measuring 36,58m (120’). 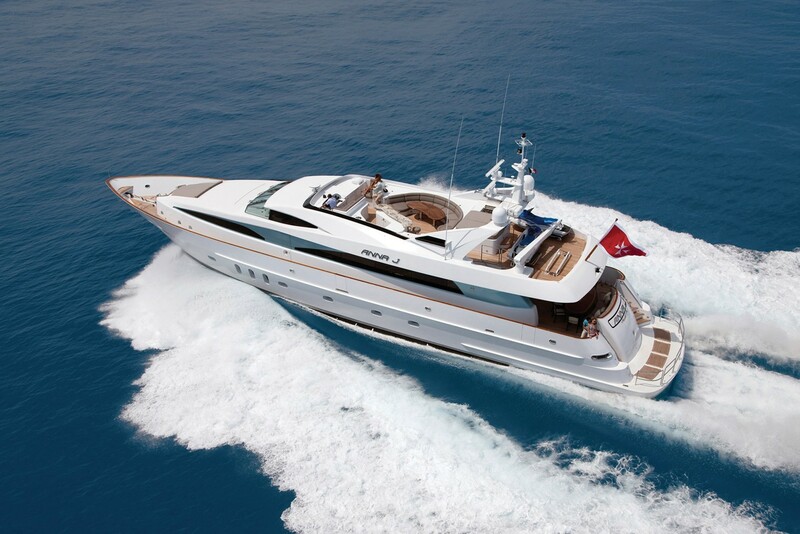 M/Y ANNA J has since received a complete interior rebuild in 2010 and is virtually a new yacht. 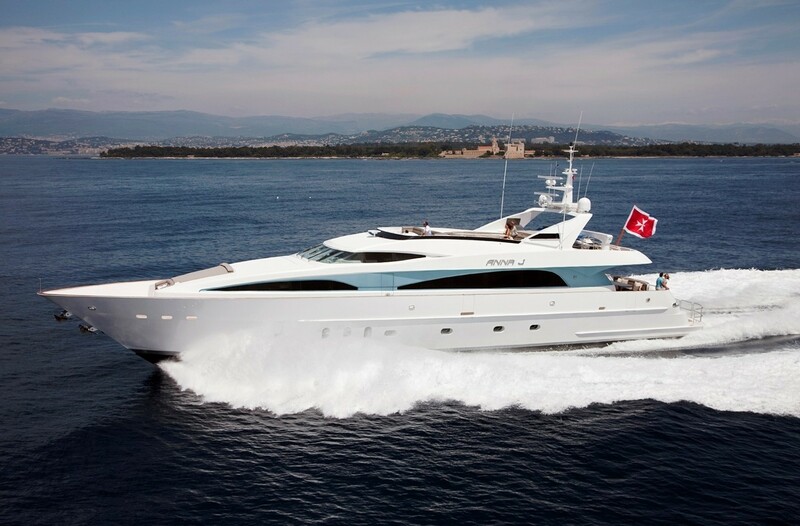 Luxury yacht ANNA J can accommodate up to 9 guests and is based in the Western Mediterranean. 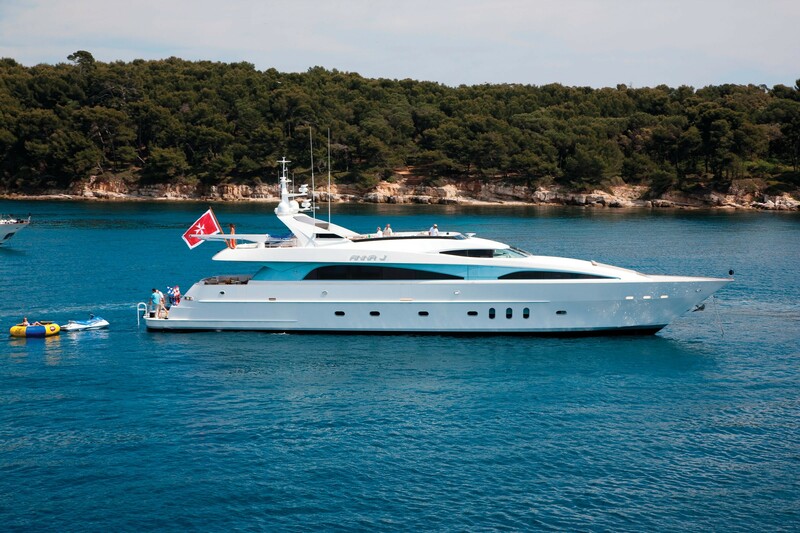 With motor yacht STREGA (ex Anna J) every area of the interior has been attended to. 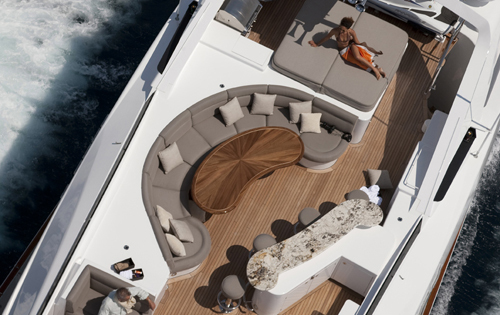 The fabric colour schemes are grey, silver, metallic and cream with high gloss Obecchi and Moabi woods and metallic charcoal paint, giving the yacht a look of modern sophistication yet is still comfortable and inviting. 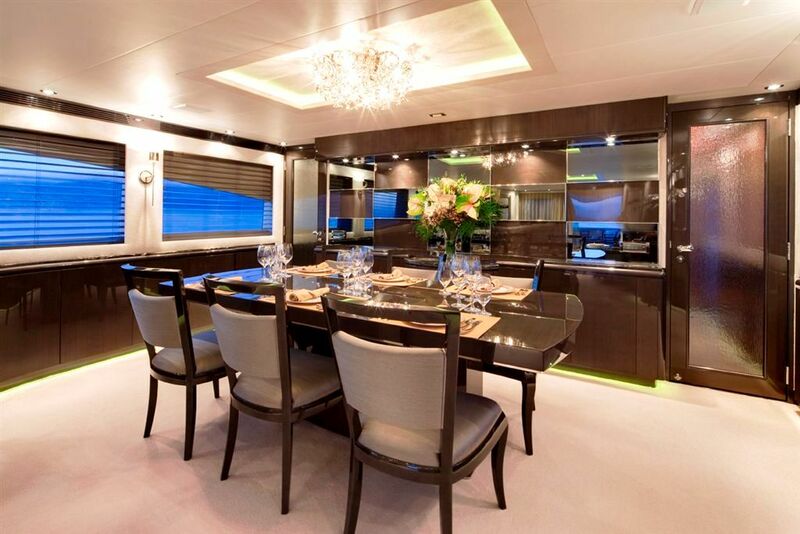 The main salon is accessed via the aft deck through a large glass sliding door. 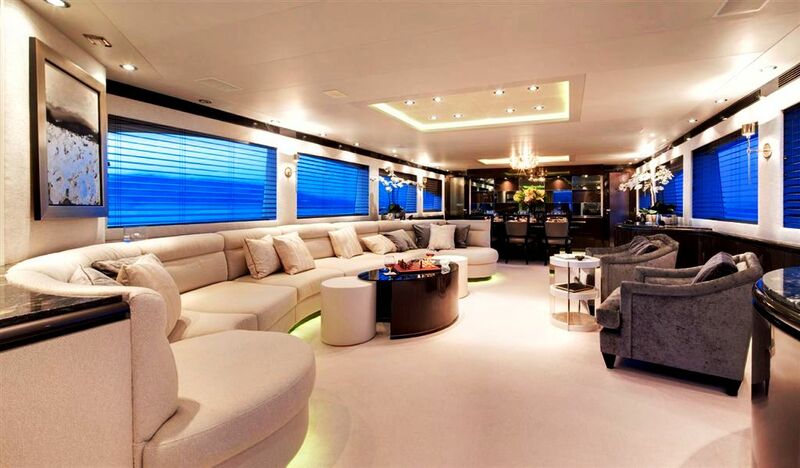 The beamy salon features a built-in couch seating 10 + guests to port with large windows enabling great views of the ocean, bays and anchorages as well as allowing plenty of natural light to filter into the salon. The formal dining area is situated forward of the salon. A completely refitted day head with onyx marble is forward to port down a short corridor. 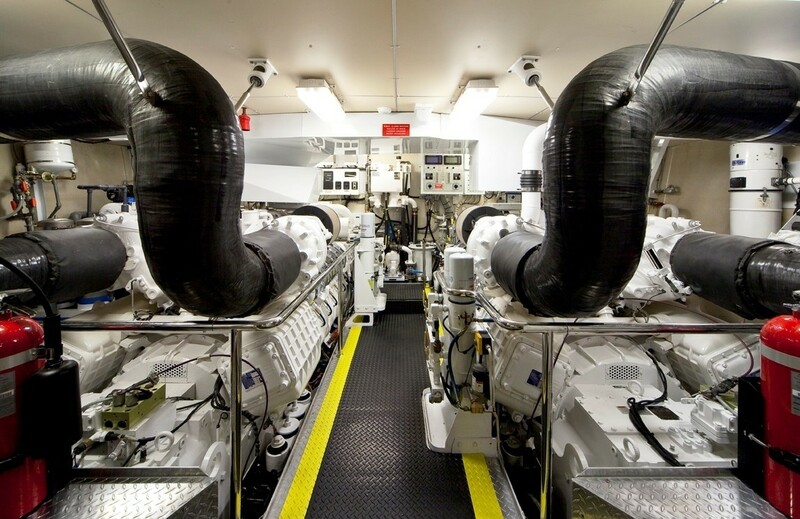 Forward to starboard down a short corridor is the galley. Also in the passage way is the 5-step stairway to the raised pilot house and the semi-circular stairwell down to the accommodation deck. 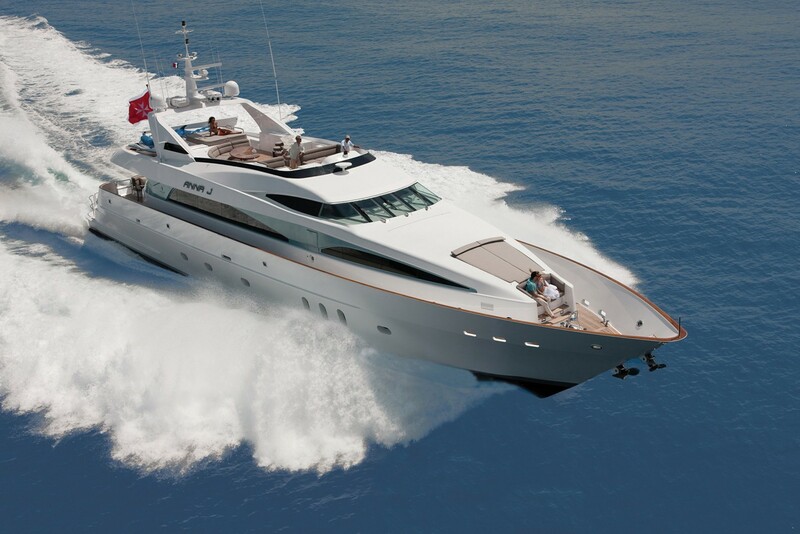 Motor yacht STREGA can accommodate 9 guests in 4 staterooms on the lower deck. 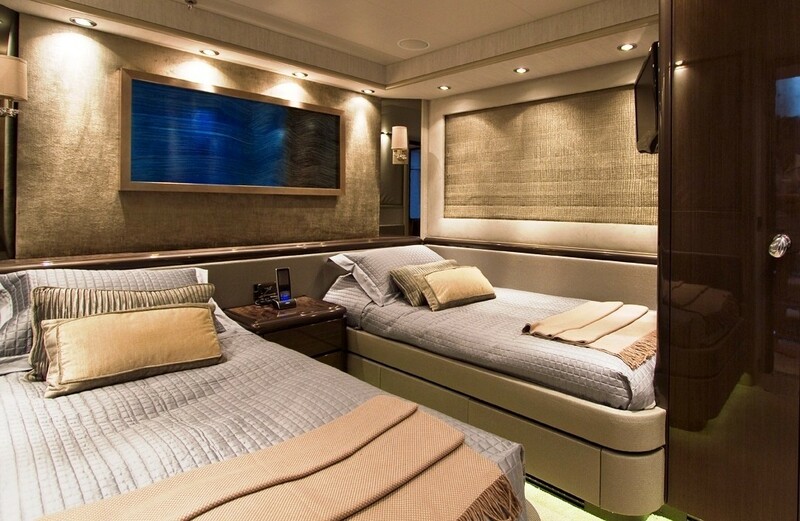 The Master stateroom is located forward with a central King-size double bed. 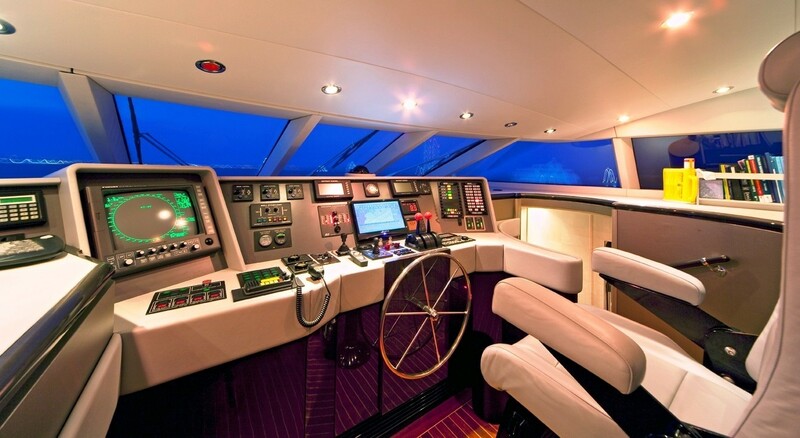 The cabin has six large portholes to port and starboard giving plenty of natural light. There are electrically operated blackout shades which will completely darken the stateroom, great for when in port or for an afternoon nap. 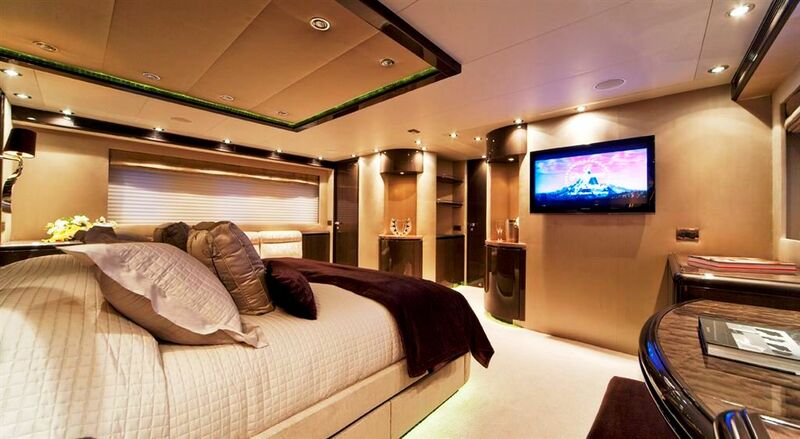 There is a Settee on the starboard side and a Vanity to port. There is also a large walk-in closet and a walk through en suite with his & her sinks and vanities with a large shower and head and large port holes for natural light. 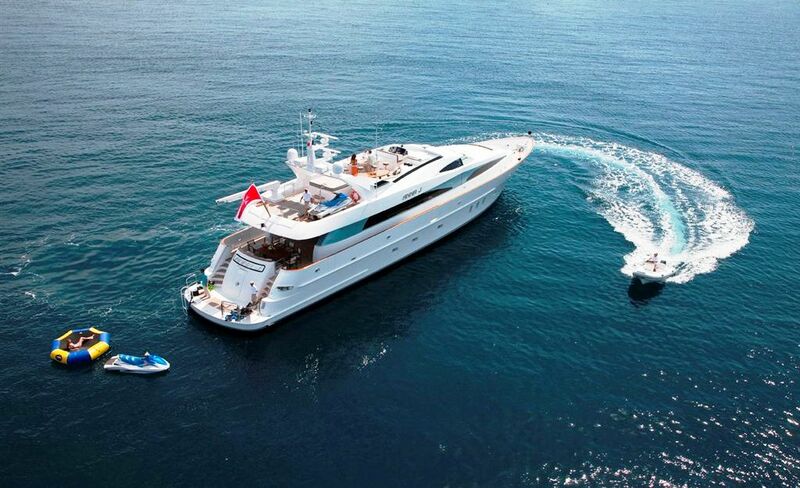 The double guests staterooms are located to Port and Starboard aft. Each has a diagonally placed walk-around double bed. They both have large full a ensuite with shower, head and vanity sinks. 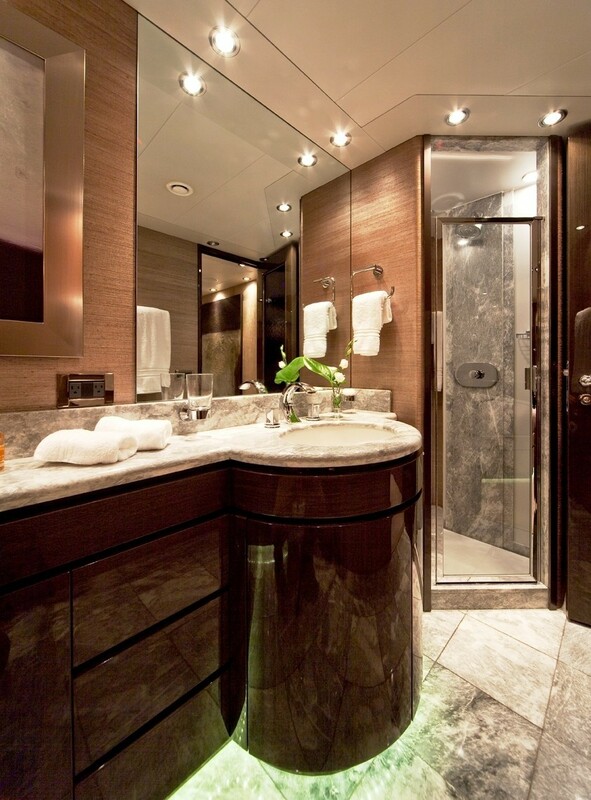 Both the ensuite and staterooms have large portholes. There is also a Twin cabin to port with 2 single beds and a Pullman. 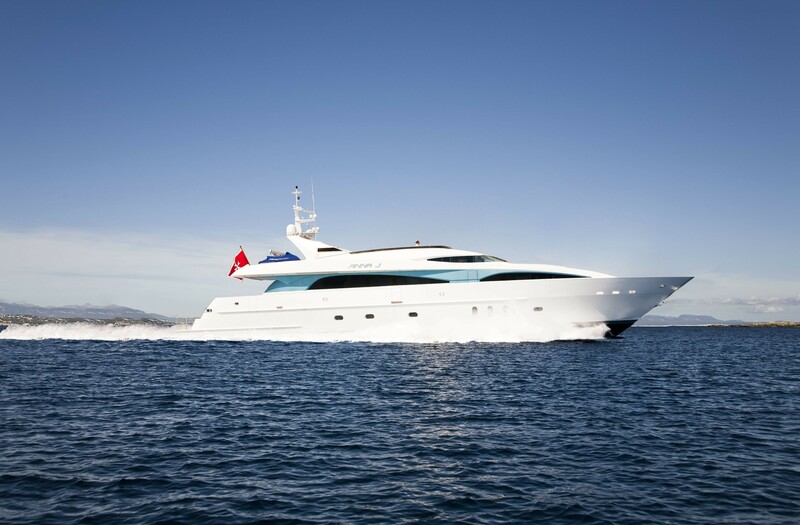 There are two large port holes and a large full ensuite with head, shower, vanity and a porthole. 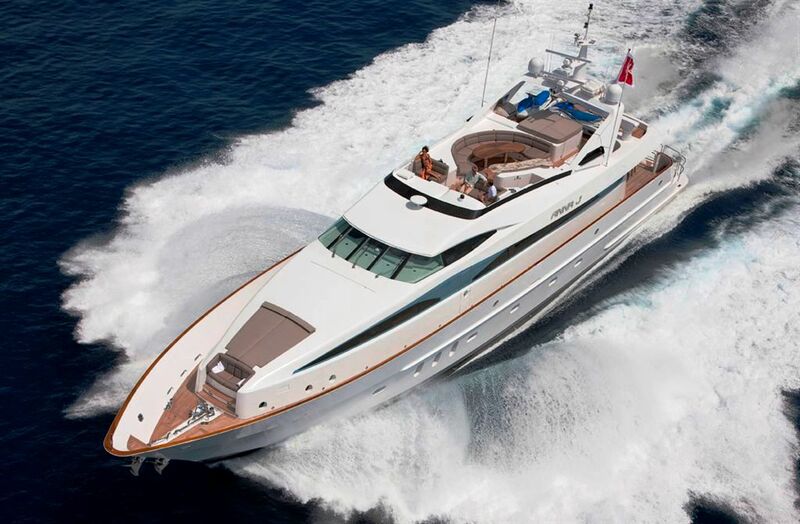 She is the ideal charter vessel. 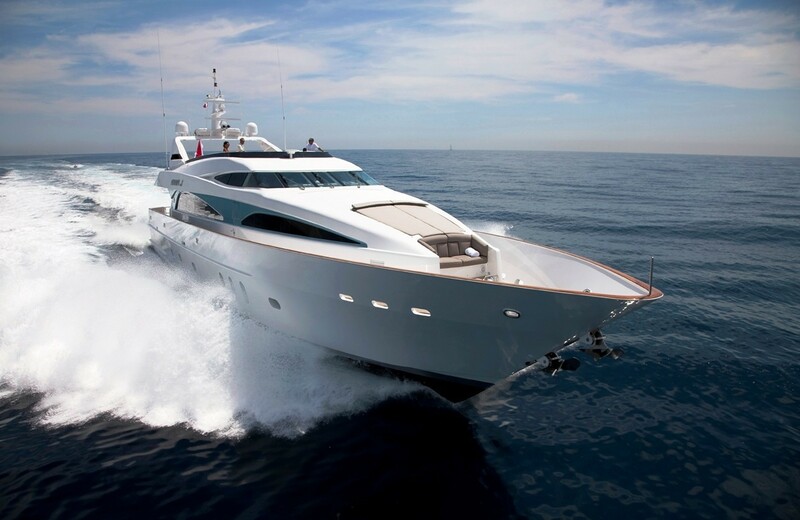 Her speed shrinks distances and her zero speed stabilisers enable you to enjoy beautiful anchorages in comfort without the need to go into port. 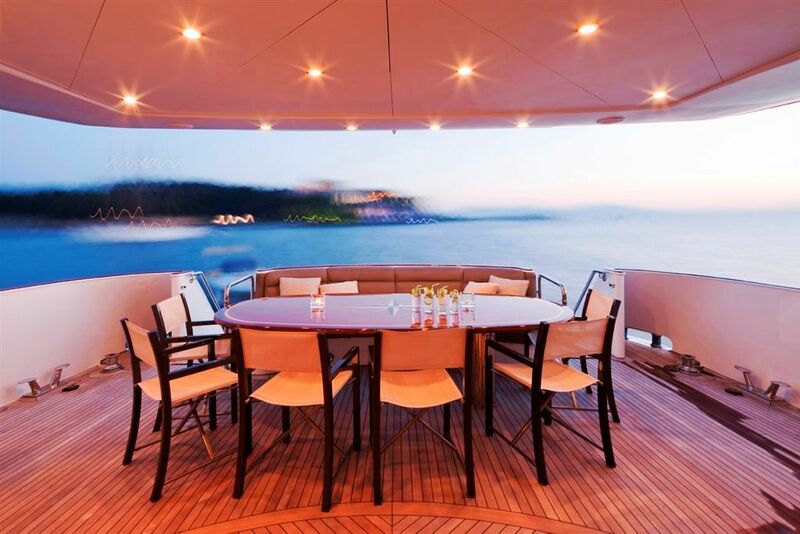 Out on deck, ANNA J provides her guests with plenty of space for relaxation. 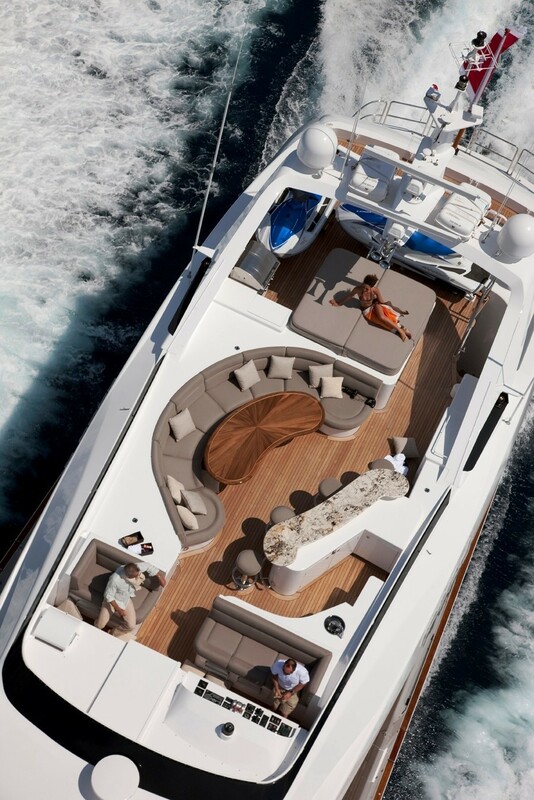 You can lounge on one of the three separate sunbathing areas, relax in the Jacuzzi or sit at the bar sipping a cocktail whilst watching the world pass you by. There are two large dining areas available, each comfortably accommodating 10 guests and both can be shaded if required. 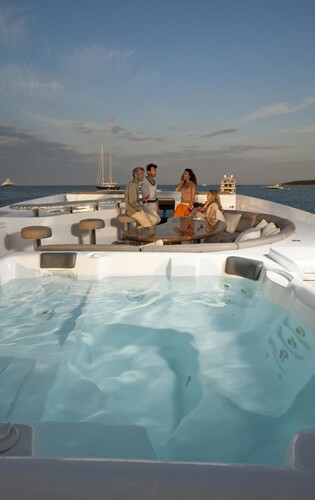 The yacht offers an enviable array of water toys for a yacht of this size including 2 x 3-man wave runners, a 14’ tender and a 25’ chase boat. In addition to the regular inflatable toys, ANNA J also offers an inflatable water slide from the top deck which is guaranteed to bring out the child in you! The Audio visual and entertainment equipment is all new including Kaleidescape and 10 new flat screen TVs. 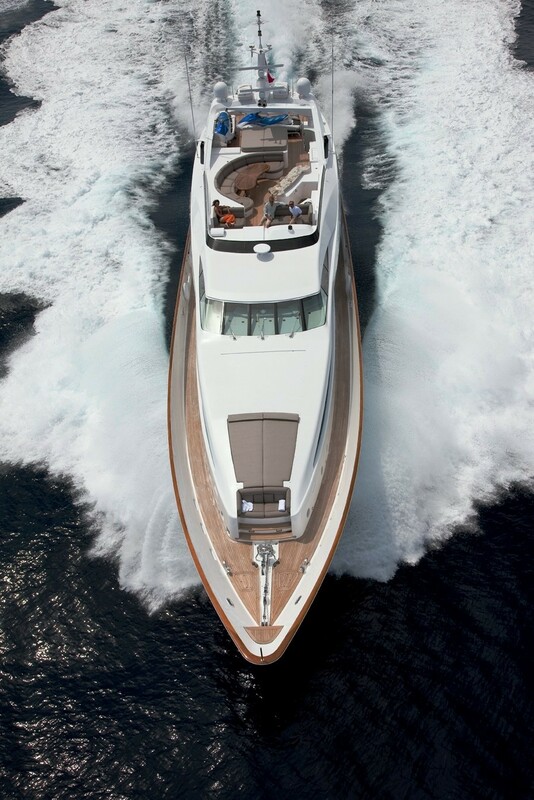 The Palmer Johnson motor yacht STREGA has a crew of 6 and can attain speeds between 26-31 knots. 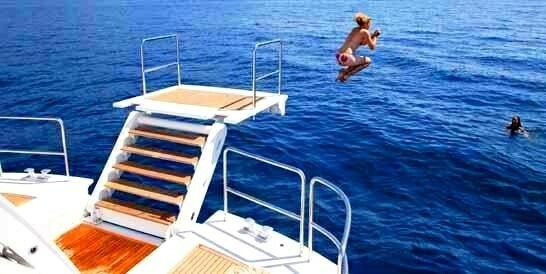 When at anchor, guests can enjoy the stability provided by zero speed stabilizers. Motor yacht STREGA can accommodate 9 guests in 4 staterooms on the lower deck. 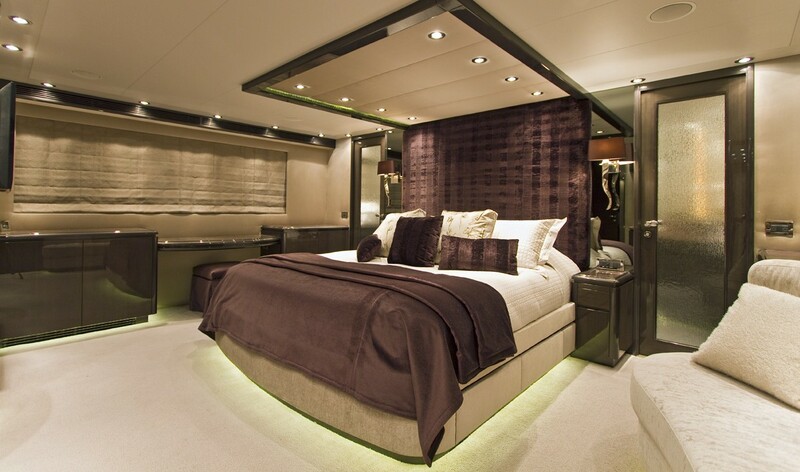 The Master stateroom is located forward with a central King-size double bed. 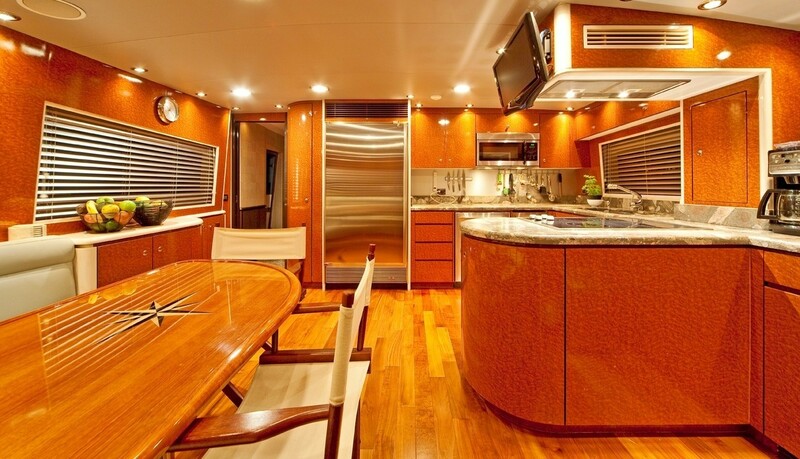 The cabin has six large portholes to port and starboard giving plenty of natural light. There are electrically operated blackout shades which will completely darken the stateroom, great for when in port or for an afternoon nap. 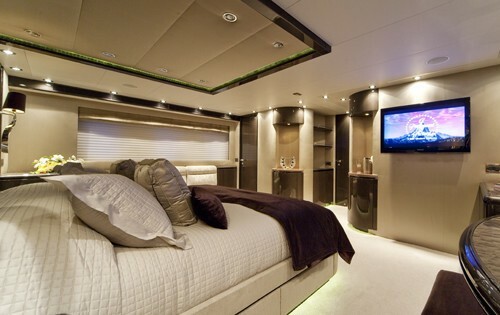 There is a Settee on the starboard side and a Vanity to port. There is also a large walk-in closet and a walk through en suite with his & her sinks and vanities with a large shower and head and large port holes for natural light. 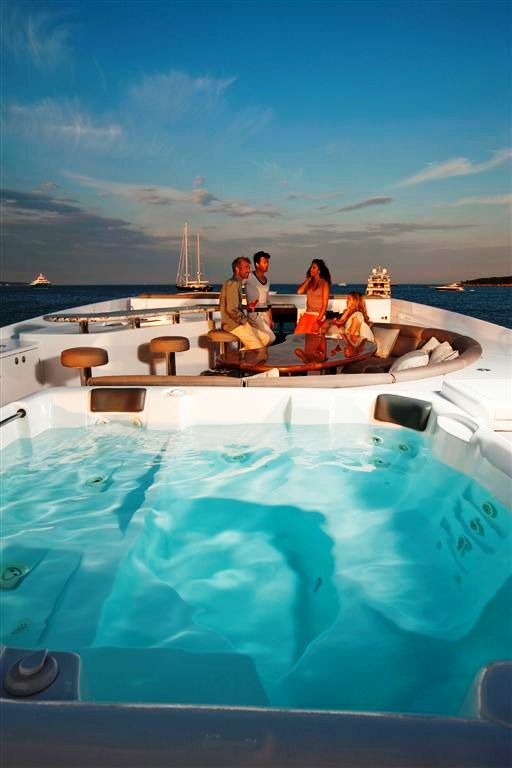 The double guests staterooms are located to Port and Starboard aft. Each has a diagonally placed walk-around double bed. They both have large full a ensuite with shower, head and vanity sinks. 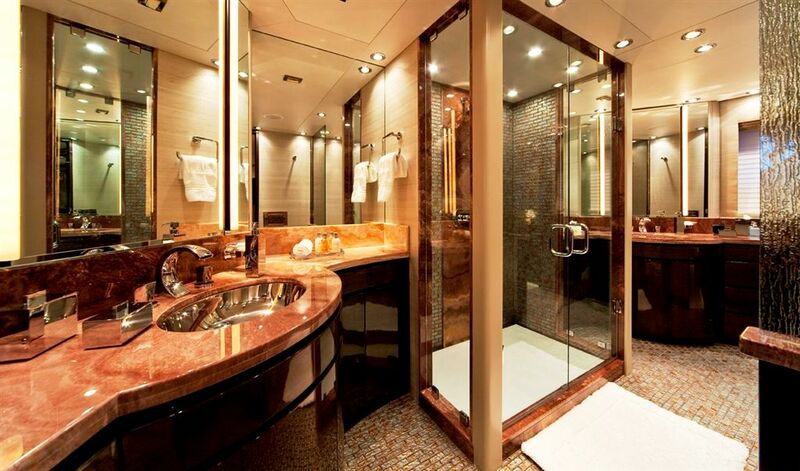 Both the ensuite and staterooms have large portholes. There is also a Twin cabin to port with 2 single beds and a Pullman. 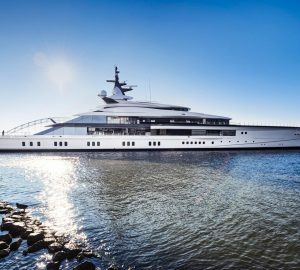 There are two large port holes and a large full ensuite with head, shower, vanity and a porthole. 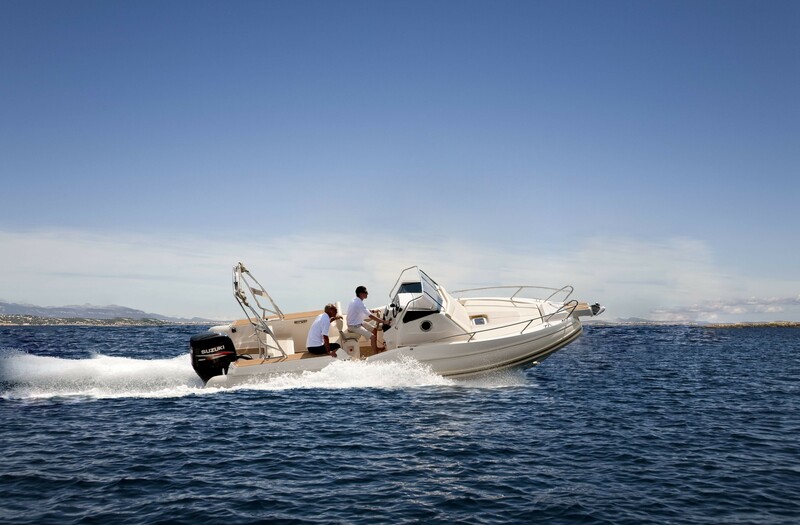 Palmer Johnson STREGA is equipped with a range of tenders and toys including: 1 x Capelli 7.7m 770WA with a Suzuku 250HP engine, 1 x 4m (14') Caribe HBI tender with a 60 hp Yamaha outboard engine, 2 x Yamaha VX 110 sport wave runners 3 man (2006), 2 x Blade fish underwater scooters, 1 x Inflatible waterslide, 3 x sets of water skis, (2) adult, (1) child, 2 x wakeboards, (1) adult), (1) child, 1 x Tow behind inflatible doughnut, 1 x Water trampoline, 7 x Wetsuits of assorted sizes, 10 x Sets of snokelling gear (masks, fins & snorkel vests), 4 x Saltwater fishing rods (2) adult & (2) child, along with light tackle. STREGA is equipped with the latest AV entertainments systems, including a Kaleidescape server with hundreds of movies and Sky TV. Each stateroom and the Salon have their own individual choice and full control. The staterooms are also equipped with their own video iPod docking stations and all are operated by touch screen remote control. Simply drop in your iPod or iPhone and enjoy your own selection of music and video. 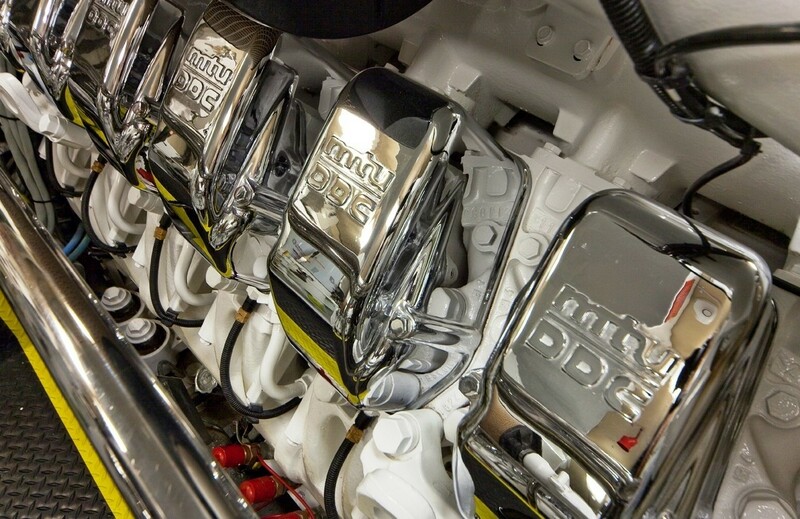 I-Pod docking stations are available throughout the boat and each area has individual volume control. The salon also has a Wii games console, together with a selection of the latest accessories and games. 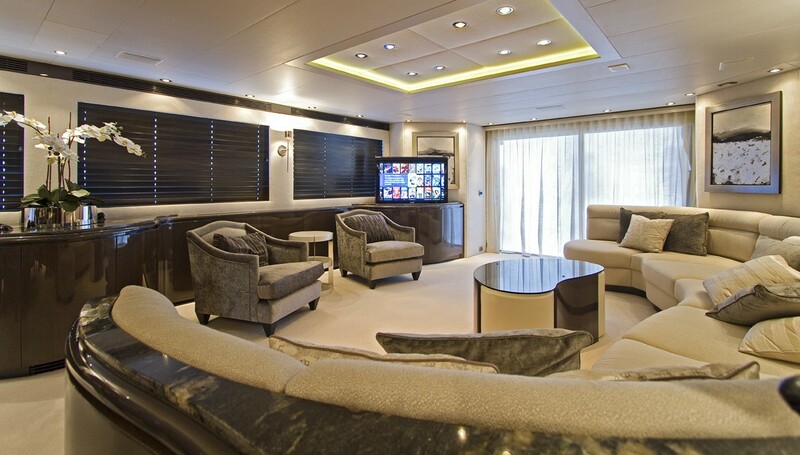 12 new flat screen TVs have been installed throughout the yacht, along with 8 Sky receivers and 5 Kaleidescape players. 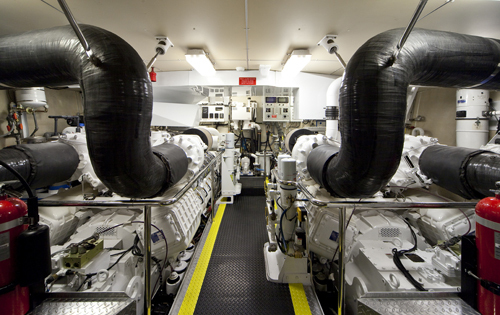 Communication facilities onboard include Wi-fi with a local sim card used according to location (country) and Fax via internet. She is also equipped with zero speed stabilizers.